Hi everyone! Happy Friday! And yep, you guessed it… I’m doing the happy dance just like I do every Friday, lol! Today is my post day on the Dare 2B Artzy blog and I’m happy to share my DT inspiration project using Flowers for Mom stamp set, Paradise ink and Blissful Bloom paper. I created a fun boxed set of 6 note cards. This is the second set of these I’ve created and I can’t tell you how much fun they are! My inspiration originally came from a tutorial I found for a set created on a smaller scale, however, I adjusted the measurements to accommodate regular A2 sized cards. I’m happy to share these instructions on my “Freebies” page (right sidebar). My version has a magnet closure under the flap and I also decorated the back of the box. I used both sides of this gorgeous double-sided paper along with the strip across the top. I always say that you should keep that strip on the top of all the Dare 2B Artzy papers because it coordinates perfectly and makes a great embellishment! I designed the ‘hello’ note cards to coordinate with the box, using both sides of the paper and the decorative strip. I added a stamped sentiment on a punched ticket ‘tab’ tucked under the strip along with some flat-back pearls. And here’s the back of the box. Loving how this turned out! I have lots of Bugaboo digis in my stash so I chose their ‘Egg Tulip Bunny’ image which I just love! I had the best time creating this card! I dug out an Easter paper pack that I won several years ago and used a few coordinating prints. I layered all the elements on either green cardstock or patterned paper from another gorgeous paper pack. Sure do love my paper, lol! This card definitely needed one of my signature big bows so I added some looped twine behind it. I stamped a fun sentiment on a stitched flag and added some flat-back pearls to complete the front. I decorated the inside with some leftover strips of paper and cardstock used on the front, and stamped an Easter greeting. Hi everyone! Happy Hump Day! Hope you’re having a great week and you’re having nice Spring weather where you are! I’m absolutely thrilled to be guest designing again for Crafting By Designs! My ‘just because’ card with the mirror stamping was in the March Spotlight and I was invited to be a guestie! How awesome is that?! I’m really excited to share my GD inspiration project for the Girls or Flowers challenge! I created a pop-up gift bag card using a somewhat CAS ‘positive/negative’ stamping technique. I really enjoyed creating this – I’m getting more into clean and simple cards and I love a navy blue and white color combo! I am in love with this large dahlia flower stamp! I stamped it off the right side of the navy blue panel and heat embossed it in white. This is the ‘positive’ stamping. I die cut a stitched flag from vellum and stamped the wedding sentiment in navy blue ink, then added several flat-back pearls to complete the front. I stamped the large dahlia flower in navy blue ink on each side of the gift bag I created from copy paper which is lightweight and won’t be bulky inside the card. The image on the gift bag is the ‘negative’ stamping. I stamped the inside sentiment in navy blue ink and layered the white panel on navy blue cardstock. Hi everyone! 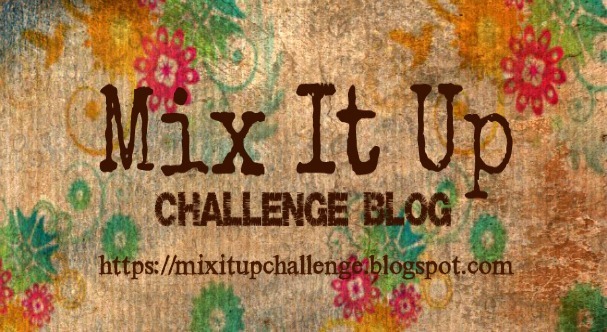 A Just For Fun challenge has just been posted over on the Mix It Up Challenge Blog to play in while you’re waiting for our first ‘official’ challenge to go live May 1st! For every 100 participants, I’ll be giving away a mystery prize! Just as a reminder, we are a monthly technique challenge blog featuring various techniques on mixed media projects, altered art, and/or paper crafts- cards, tags, mini albums, ATCs, 3-D projects and scrapbook layouts! Anyone can play in this challenge … you can use any technique you want … you can enter this challenge as many times as you want … you can combine this challenge with as many other challenges as you want! The only thing I ask is that you please share our badge and link to the Mix It Up Challenge Blog in your blog post so your crafty friends can come over and play too! This challenge will close on April 30th at 6:00 PM EST and the winner(s) will be announced on May 5th at 6:00 AM! Hope to see you there! Let’s ‘mix it up’ and get this FUN started – can’t wait to see what you create! I die cut the two pieces for the gift bag and put it together, then just started layering vintage images and elements. I inked all the elements with Antique Linen distress ink, and then splattered white paint and purple shimmer ink. Here are a few more photos taken at different angles. I love how this turned out! I hope you’ve enjoyed this gift bag and will create an Easter project for our challenge this time – anything but a card! Thanks so much for stopping by today – we’ll see you next time! Hi everyone! Gotta say “cha, cha, cha… it’s Friday” and I’m once again doing the happy dance! Love my Fridays! Hope you have a great weekend planned! Today is my post day on the Dare 2B Artzy blog and I’m stoked to share my DT inspiration project using the Paisley Bliss and Tall dark & Rich stamp sets, Pomegranate ink and Fields of Joy Orange Plaid paper. I created the cup out of white cardstock and added a decorative band made of pretty plaid paper layered on orange cardstock along with a corrugated wrap. I cut the sentiment with a stitched oval die and adhered several loops of cord behind it for a little interest, and finished it with several blue Dot Sparklers.